Darktable Best Photoshop Lightroom Linux Alternative FREE. Darktable is an Open Source Photography Software --a photo workflow software for Linux source photography workflow application and RAW developer. This guide will show you how to install Darktable as a photography software for linux and its review. Darktable become popular program for photography because have same functionalities which is similiar to Adobe Photoshop Lightroom, thus will make Darktable is the best Lightroom equivalent software. Darktable is an open source photography workflow application and RAW developer. RAW is the unprocessed capture straight from the camera's sensor to the memory card, nothing has been altered. There are multiple alternatives in the open source world for RAW development (ufraw, dcraw, rawtherapee) but darktable tries to fill the gap between the excellent existing free raw converters and image management tools (such as e.g. ufraw, rawstudio, f-spot, digikam, shotwell). It focuses on the workflow to make it easier for the photographer to quickly handle the thousands of images a day of shooting can produce. It's also one of the very few FOSS projects able to do tethered shooting. 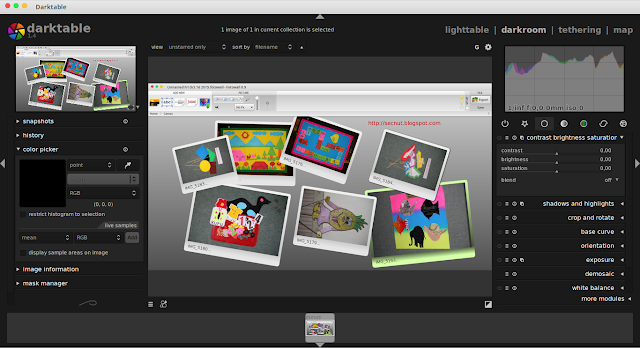 darktable runs on GNU/Linux / GNOME, Mac OS X / macports and Solaris 11 / GNOME. All darktable core functions operate on 4x32-bit floating point pixel buffers, enabling SSE instructions for speedups. It offers GPU acceleration via OpenCL (runtime detection and enabling) and has built-in ICC profile support: sRGB, Adobe RGB, XYZ and linear RGB. A collect module allows you to execute flexible database queries, search your images by tags, image rating (stars), color labels and many more. Filtering and sorting your collections within the base query or simple tagging by related tags are useful tools in your every-day photo workflow. Import a variety of standard, raw and high dynamic range image formats (e.g. jpg, cr2, hdr, pfm, .. ). darktable has a zero-latency fullscreen, zoomable user interface through multi-level software caches. darktable currently comes with 18 translations: Albanian, Catalan, simplified Chinese, Czech, Dutch, Finnish, French, Galician, German, Italian, Japanese, Polish, Romanian, Russian, Spanish, Swedish, Ukrainian and Thai. The powerful export system supports Picasa webalbum, flickr upload, disk storage, 1:1 copy, email attachments and can generate a simple html-based web gallery. darktable allows you to export to low dynamic range (JPEG, PNG, TIFF), 16-bit (PPM, TIFF), or linear high dynamic range (PFM, EXR) images. darktable uses both XMP sidecar files as well as its fast database for saving metadata and processing settings. All Exif data is read and written using libexiv2. We recommend Darktable to subtitute Photoshop Lightroom. It is powerfull software and more over it is FREE. 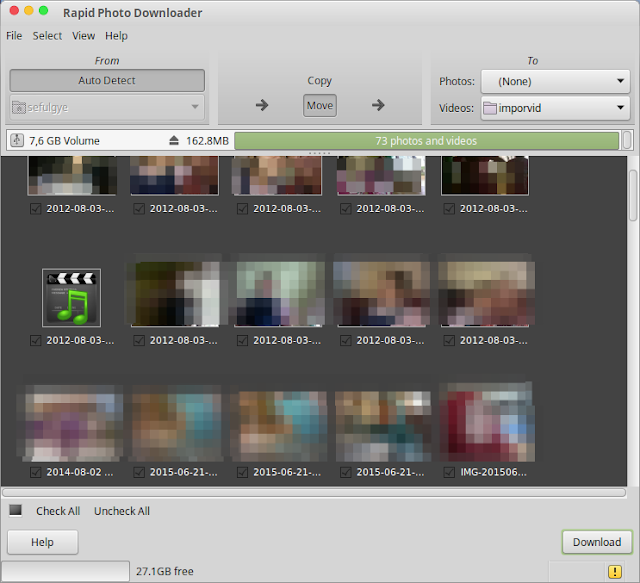 Rapid Photo Downloader is a Linux software used to Import Photo and Video From Camera and Storage in Linux. This article will guide you how to install Rapid Photo Downloader and review about it. Rapid Photo Downloader is written by a photographer for professional and amateur photographers. Released under the GNU GPL license, it is designed for use on the Linux Desktop. It can download photos from multiple cameras, memory cards and Portable Storage Devices simultaneously. It provides many options for subfolder creation, image renaming and backup. For many cases, for importing pictures and videos from camera you don't need to open from Start/Menu, the software will detect your camera and will prompt for you. This is the best application to work with something such as Darktable without a proper photo importer. 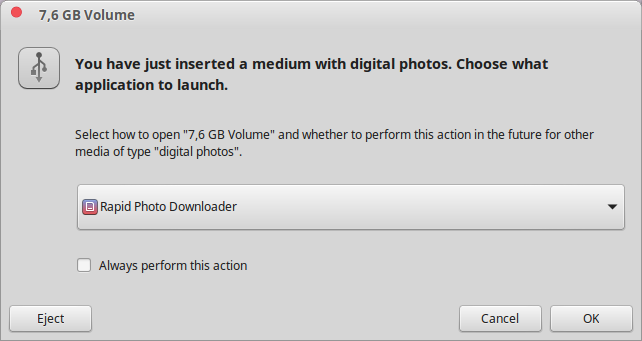 Rapid Photo Downloader prompt a notification to offer media handling when a camera, phone memory inserted to computer. With this features, you can manage video and picture easily to copy or move it. With this software you can bring your files from the camera to the computer and renames them - all custom configurable to your taste. Well designed and not over-complicated, works perfectly. You then need to use rawstudio for developing, gimp for any tweaks, the std file manager for arranging folders, and kb3 for archiving. NOTE: to use the newest version please use PPA above!